Some of you may recall the cute blocks I made for a customer a few months ago,here. I added a custom listing to my etsy store today. Design your own baby shower gift! 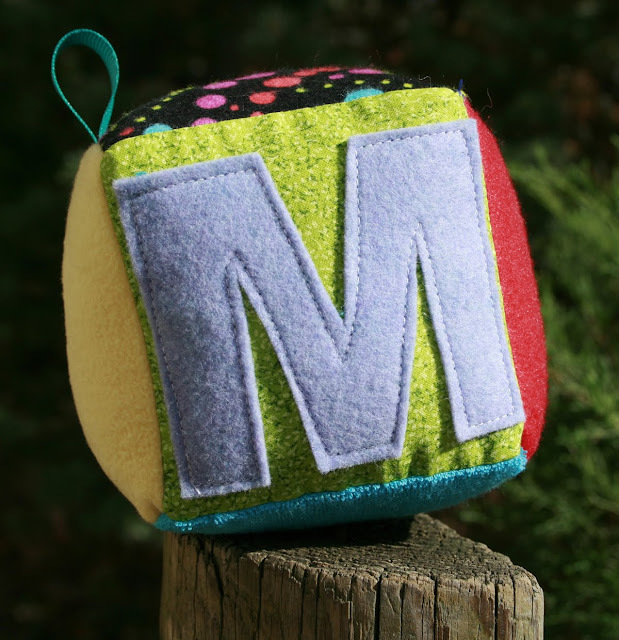 Personalized fabric baby blocks with the child's name is the perfect gift for any new baby in your family. It's also the gift that will continue to engage and grow with the child through the different stages of development. I use many different coordinated, textured fabrics to enhance sensory development. Corduroy, chenille, terry cloth, fleece, cotton etc. You pick the color palette and I will coordinate a gender specific set. Is there a color you/mom/dad can't stand? Let me know, I am so happy to make this gift the way you want it. Each block measure 4 inches and filled with polyfil. The letters are felt. Some of the blocks will have a jingle bell and/or ribbons sewn in for the child to grasp. I only use small stitches to insure extra seam durability so that the blocks can withstand being played with by any child. I look forward to making the perfect set for you!